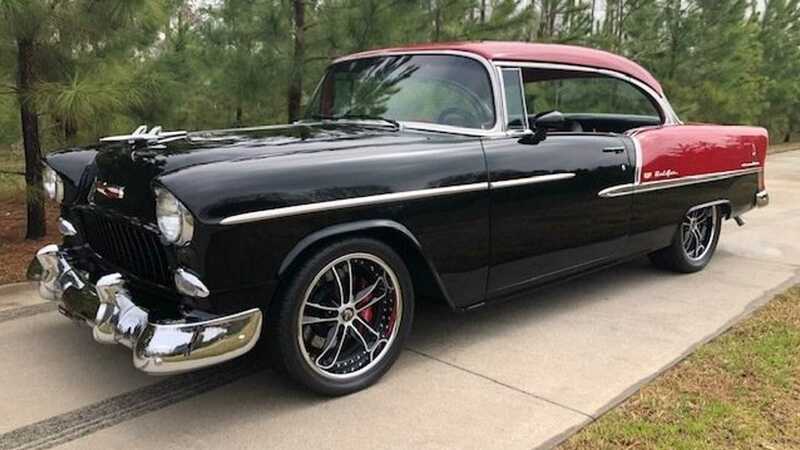 This 1955 Chevrolet Bel Air perfectly combines the classic old-school looks with the new-school drivetrain and luxury features inside the cabin. The 1955 Chevrolet was considered to be a huge turning point for the bowtie brand and was a major sales success. The '55 Chevy was available in three variants: the 150, 210, and Bel Air. 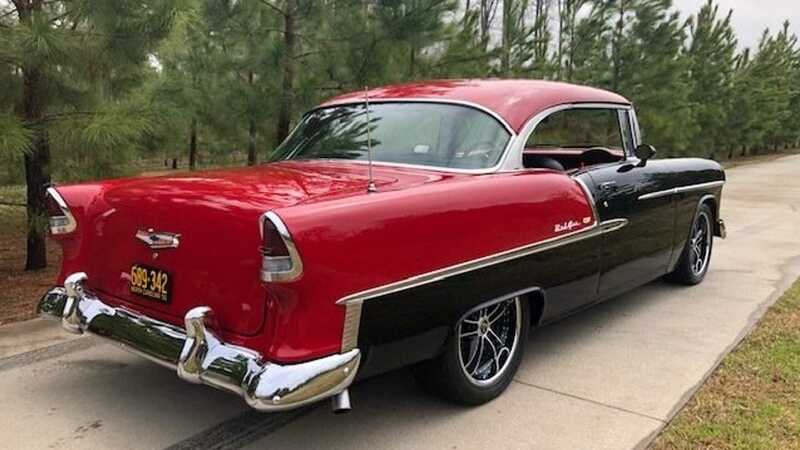 Chevy only manufactured this car from 1954 to 1955, but in that one-year production run, the vehicle was available as a two-door coupe, hardtop, convertible, station wagon, sedan delivery, a four-door sedan, and a station wagon. The '55 Chevy was manufactured at plants in the United States, Canada, and Australia. 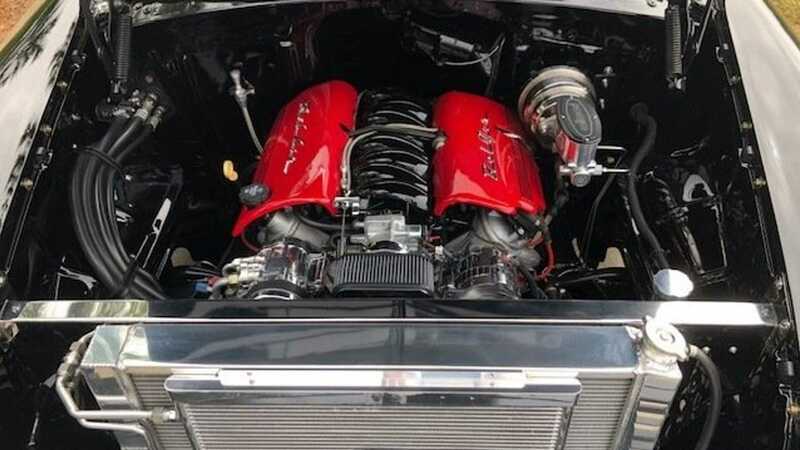 Under the hood, the '55 Chevy was powered either by a 235 cubic-inch OHV inline-six cylinder engine with 135-horsepower or a 265 cubic-inch OHV V8 which either produced 162-hp in standard tune, 180-hp as a "power pack" engine, and 195-hp as a "super power pack" engine. 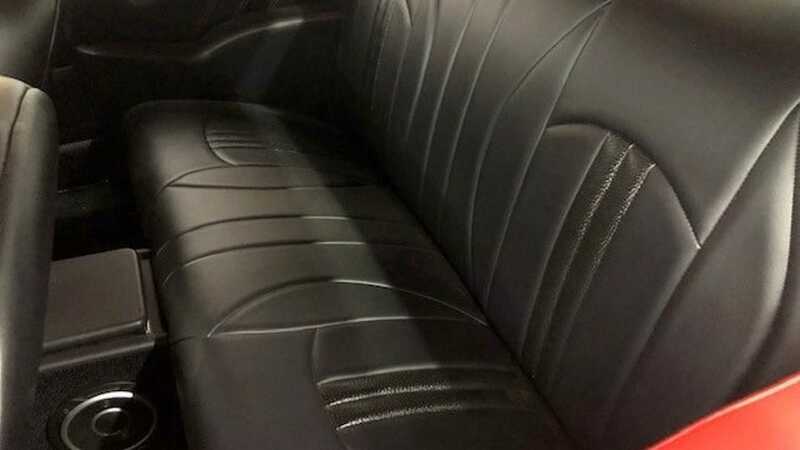 Depending on the engine choice, the Chevy came equipped with either a three-speed synchromesh manual, a three-speed synchromesh manual with overdrive, or a two-speed Powerglide automatic transmission. 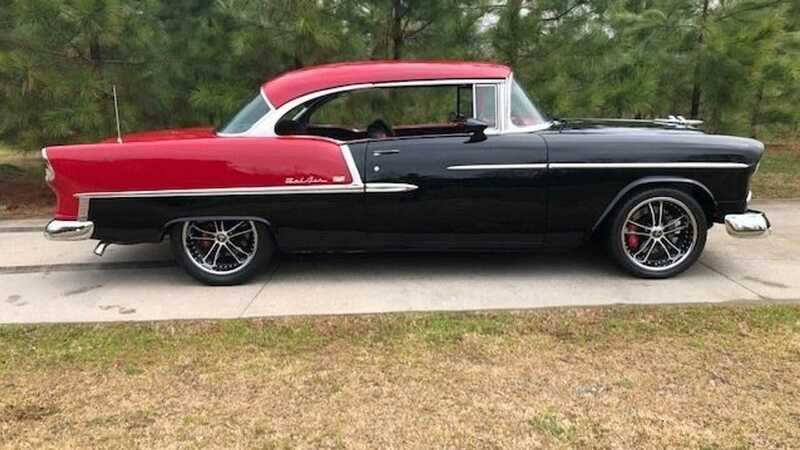 This particular 1955 Chevrolet Bel Air currently up for auction at Greensboro Auto Auction in Greensboro, North Carolina is a tastefully built Pro Touring/ Resto Rod machine. Under the hood, this beast is powered by a 5.7-liter LS V8 engine with an LS6 intake. The engine sends power to the rear wheels via a new 700R4 automatic transmission with overdrive built by Bowtie. 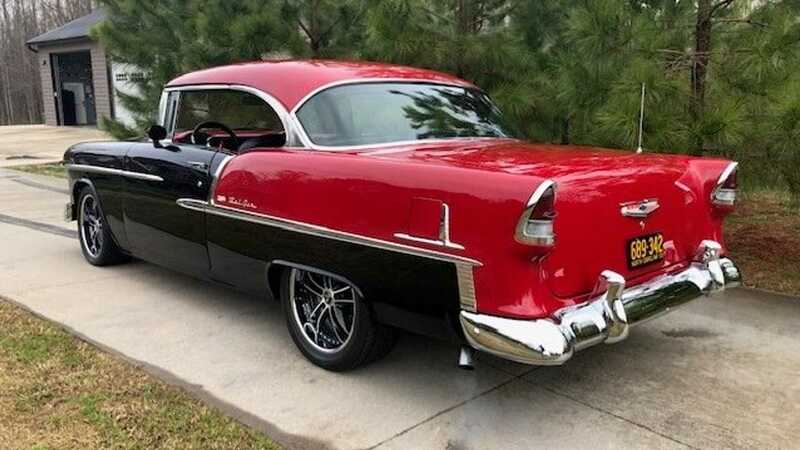 The listing states that his '55 Bel Air Pro Touring is fitted with power rack and pinion steering system, Vintage Air sure fit air condition and heat, custom color matched DUB 18-inch three-piece wheels, custom crossflow radiator with polished stainless core support, and a rebuilt rear end with 3.55 gear. The LS engine exhales the exhaust through dual pipes fitted with Flowmaster mufflers and coated headers. 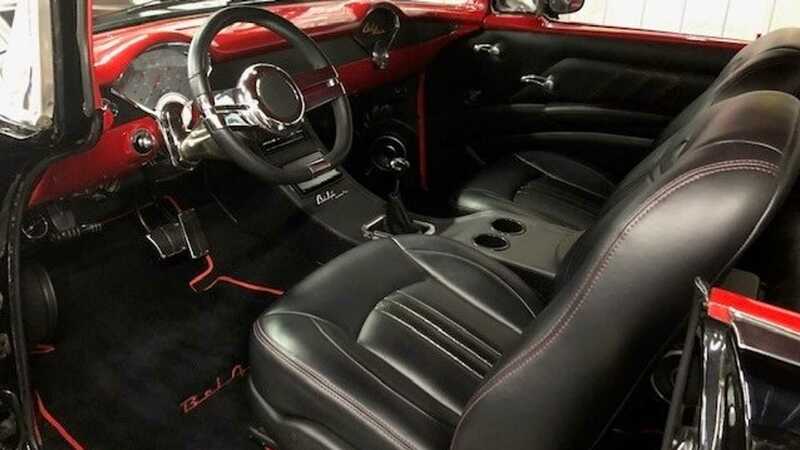 This black and red Bel Air comes to a stop thanks to Wilwood braking system which features slotted and drilled rotors on both axles with six-piston calipers up front and four-piston calipers at the rear. 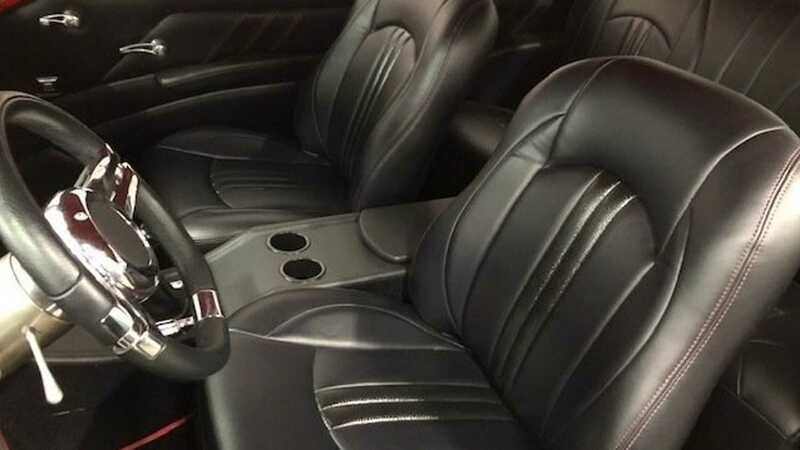 The interior features six-way power-operated front bucket seats and a plush rear bench upholstered in custom black leather with contrasting red stitches. The cabin also features power windows, a custom center console, and a high-end stereo system. 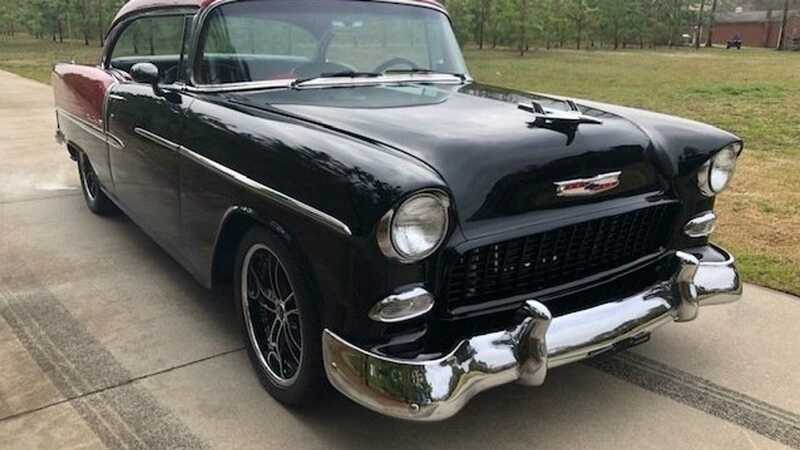 So, if you wanted to own a retro automobile which perfectly combines the classic old-school looks with the new-school drivetrain and luxury features, then check out and bid on this 1955 Chevrolet Bel Air Pro Touring/ Retro Rod at Greensboro Auto Auction.